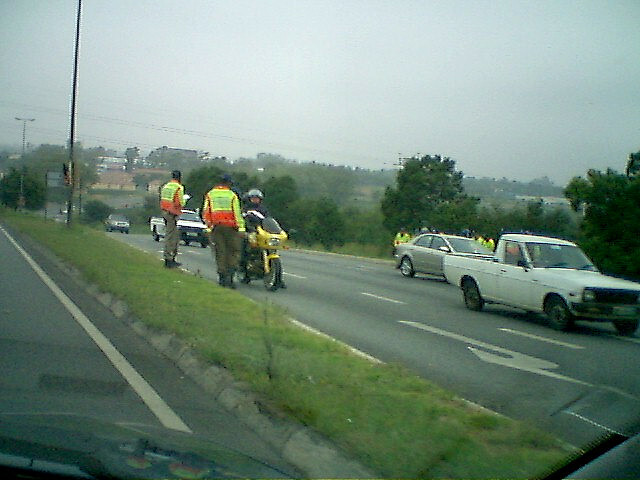 Metro Police are utilising new methods to ‘trap’ speeding motorists. This past Sunday (14 June 2015) they set up a remote camera in the kyalami area. They set up the camera on the M71 Main road. Anyone familiar with this road will know it is a dual lane road that is fairly wide and features a few downhill sections. Needless to say, the remote camera was set up on the downhill which is an 80km/h zone. However, some of us have seen the remote camera’s set up before, they are popular on the highway. These small cameras are hard to see as they are extremely small and grey in colour. There are also no Metro cars nearby and a simple shrub or dustbin is enough to conceal the camera altogether. However, Metro, In partnership with Nikon, have set up these cameras with antenna that feed the picture and speed recording to a road block on either side of the road a few kilometres away. Now the small camera that is impossible to spot, sends the road block a live feed of your speed and next minute you are pulled over and issued a summons. This is no longer speed trapping but rather entrapment! It is impossible to see the camera and they are always set up on wide open roads with no traffic and on steep downhill’s. This is just another money making scheme so be aware. Because you are issued a fine on the spot you have less time to appeal against the fine. Thanks Nikon and Metro! I am sure there is a story behind that partnership also.